Are Your Website’s Images Consistent With Your Message? Ensure images retain their meaning amid current events. A picture is worth 1000 words. What happens when the outside world changes and your picture might convey an unintended allusion? A nonprofit organization that promotes dialogue among disparate — and usually opposing — stakeholders used images on its website to highlight issues it was tackling. One picture, unwittingly, referred to a hot-button topic. 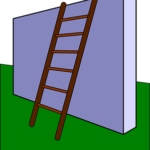 It is a cement-brick wall; a ladder leans against it, suggesting the wall is rather high. Given the recent, hotly contested discussions of political relations with Mexico, this image appears to reference immigration issues. Actually, the subject is economic mobility. Another image: a group of smiling girls running towards the reader. This referred not to women nor exercise, but to re-thinking education, yet there were no teachers, classrooms, books nor computers. In our discussion about the website and images, the nonprofit’s Director of Communications noted my comments on the gap between the images and the intended context of the subjects. These two images have since been changed. One is now a graph that is more explicitly aligned with the theme of economic mobility. The other shows children engaged in using a mechanical contraption as an example of a non-traditional way that students learn and explore. Clearly, selecting an image for a website is fraught with issues of perception, at the surface and in the context of internal and external references. Make sure you own the image or have properly licensed it. Respect the work of the artist or photographer and negotiate the terms of usage and credit. If you prefer to use stock photographs, search the copyright-free or royalty-free websites. Have a person in a photograph, even if viewed from behind or at a distance. If you are promoting a destination, you are asking visitors to put themselves in the photo, similar to those pictured. To pull heartstrings for an emotional appeal, display a person or animal in need. Ask people outside the organization what the image says to them — without the benefit of a caption. Take note of how closely their ideas correspond to the intended theme. When you compose the caption, make it underscore the message more than Person consulting a representative or professional. The people in all photographs should appear authentic and contemporary. Within a group of four or more, aim for diversity by gender, ethnicity and age, when possible and appropriate. Search the internet to see where else the image may have been used. Readers may sense it is familiar and conflate the two uses. As with any written content, let the image percolate for a day; consider it again, to ensure it still matches and resonates. Finally, review the image on a scheduled basis to ensure its relevance to both the nonprofit’s mission and the external environment. In addition to the photos and context cited above, references to pop culture, for example, can become outdated and reflect poorly on the organization. There is a difference between copyright, licensing, rights-managed images and royalty-free stock images. The company that owns the image may place limitations on the medium or format where an image is used (website, advertising, brochure), geography (domestic or international) and time frame (one year or unlimited). Here is a basic primer. A stock agency sales rep or graphic designer will advise you. Ready to take a fresh look at your website’s images? Let’s see what story they tell when separated from the caption. Call me at 212-677-5770 or email at janet@janetlfalk.com. Thanks to Susan Rosenberg Jones regarding use of rights-managed and royalty-free photography and also to these excellent graphic designers and colleagues for their thoughtful suggestions: Christina Hagopian, Rya Kaufman, Brandie Knox, Peter Levinson, Meryl Randman and Daniella Van Gennep. This entry was posted in Marketing, Newsletters, Nonprofit on June 5, 2017 by Janet L. Falk.